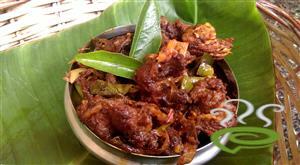 Kottayam Style Beef Fry is a spicy, tempting dish very aromatic and delicious. 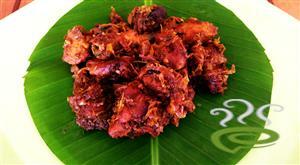 Kottayam Style Beef Fry is a popular dish in Kerala very much savored during family gatherings and functions. Kottayam Style Beef Fry is unique and special, with fried coconut pieces and black pepper increasing the taste and aroma of the dish. Roasting Kottayam Style Beef Fry to a dark brown color increases the authenticity of the traditional dish. 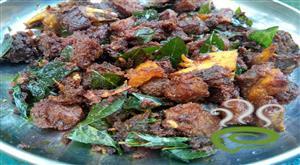 You can explore a well detailed Kottayam Style Beef Fry here that can be easily prepared at home. For preparing Kottayam Style Beef Fry, first prepare GARAM MASALA by grinding together bay leaves, cinnamon, cardamom, cloves, black pepper seeds and fennel. Cook the beef with all the other ingredients including garam masala in water. Add salt and continue cooking on low heat until almost dry but cooked. Set this aside. Heat the coconut oil in a frying pan and add a pinch of mustard seeds and allow them to break in the hot oil. Add more chopped onions and saute till brown. Add curry leaves and coconut kothu and saute till brown. Add the previously prepared beef and powdered black pepper. Stir in gentle heat until dark. The receipe is incomplete. What do i do with Turmeric powder and Tomatoes. I feel like i just made a chicken like in the movie Boeing Boeing. :-). ManuAwesome reply, Santosh. I laughed non-stop for 15 mins. Sobin - Its part of the masala. Good one..easy to prepare...thanks to Mrs Mariya and Pachakam .. Loved this recipe!! Was a great hit. I followed it exactly as given. dear, tried the recipe...was just stunning....i was wondering how it could be without chilly powder, but when i tried it , that answered me the query...thanx...keep posting such excellent recipes!!!! God one! easy to make. Was looking for something of this kind. thanks. I was searching for a good instruction to make beef fry, and after reading comments of people who made it ,i`m gonna try it.I will definitely give my suggestions after i make it . Thankx for your thoughts and may GOD bless you. Surprisingly no red chilly powder nor coriander! ever thought of making it a little more spicy with those? Ethoru adipoli recipe yanu. One of my friend told me to try this, and it was superb!! hai i tried your olettirachi i comes out with fantastic my husband liked it very much thanks very much for this nice yummy beef fry. Excellent recepie, yet simple . Make it and enjoy it . No one can give this recipie free to you. it is very valuable. Please try it today. This is the first time I am rating any recipes in internet though i try recipes from internet always..This recipe was simplay fantastic..i made it for a party and everyone loved it!! Thanks..
Thankyou so much for a very yummy recipe. It came out really very well. Cheers to aunty. Amazing recipe!!! I followed it to the letter and it turned out absolutely PERFECT! I`m back to read and try out some more! I prepared your pork piralan and it was so easy and came out so well. 5 stars for making it so simple. I was so worried about dishing it out myself the trichur pork varattiyatu style. (or we rather call it "porkirachi kalyaanavarattu". Dear Mariama Varghese - you are doing a gr8 job for ones like me.Keep going. ONE REQUEST - PLS ADD SOME VEG.RECIPES B4 ONAM 2007.
i tried this,it was good.thanks for the recipe. this is so tasty and it came out so well for me... i used less amount of oil... pls do post good recipies like this.. can u pls post a recipie to make beef curry with gravy?? Did I read 1 *cup* of coconut oil correctly? That sounds like a lot. It was excellent. It came out very well even the first time. I have tried many times. This has become our permenant recipe for beef fry. Many thanks for your recepie,have tried it twice and came out very well. Excellent!!!!!! !..This is the first time i am cooking Beef and this recipe turned out sooo well..Please keep posting new recipes...Thanks a lot.. I tried your recipe and it is excellent. It came out really well and I am glad that my husband liked it very much. He said it is great. Excellent! 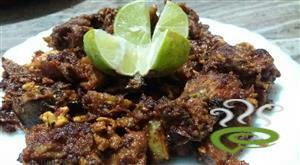 !I`ve tried beef fry many times but this was the best one. This was a really awesome recipe. I tried it, and it came out really great. Veryyy yummy.. appreciated by all!! A great recipe, especially for a beginner like myself. First day I made it, I thought it lacked masala but that could be just me. My whole family loved it and is asking for more... and it didnt need coriander or chilly. It was still spicy and very good!!! Oh.........Mariamma........ you are so excellent. Thankyou so much for your wonderful recipes. Thanks Mariamma ! my hus liked it very much. Dear Mariamma, you are such a wonderful chef. We all love your recipes. Beef fry. excellent. very good recipe ,so simple and testy. Came out well,I loved it, so as my husband.thank you. I have never made beef better than this. Excellent! But what about two main things like Chilly and corriander?? Excellent recipe. Proud to be Kottayam guy. I tried.It is very tasty. no need of coriander powder and chilli powder? 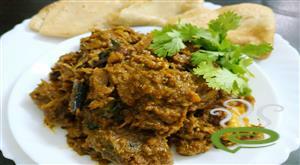 this is an excellent recipe-typical kottayam beef ulattiyathe! kottayam receipes are really the tastiest,,particularly the achayan tastes.....reallly yummy,,,,waiting for more kottayam receipes.particularly something with pork and even mushroom. Yum ! Was looking for this recipe for long and now after cooking this it was yum. Thanks more recipie. 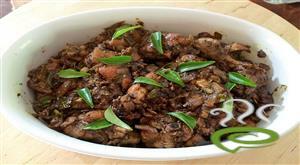 One of the best recipe`s for beef.... tastes authentic as well as traditional ! A really good recipe except for minor language problems. It tasted very authentic. excellent. Very good, thanks a lot!! Realy good and tasty. Marvellus!!!!!!!!!! I was amazed at the good ratings that this recipe got that once I tried it I had to admit that it was the best. I avoided frying it in the end with more chopped onions and cut down on the coconut oil.. result was amazing. This was an amazing recipe !! Thanks for that.I tried it with Mutton and it came out very well.All of us loved it ! Great recipe!!!! I tried lot of ways to prepare a good beef fry, till now no one was satisfying me. But this one is too good!!! I dont want to try another recipe for beef fry. Thanks a lot chef!!! Excellent Recipe. I tried the same recipe with mutton and liver and they turned out good too. Please sumbit few more kerala recipes. Recipe came out very well. Excellent job!! What more to say...I first tired ur Pork recipe, it was so tasty that now we have pork each week.And upon this now this beef recipe is so wondefully delicious, even we had it for our pot luck for 25 people..can u imagine....Pl madam do keep adding on ur talents to our list God bless ur hands. This was an excellent recipe Ms Mariama varghese. We really loved this dish. Could you put in some more recipes but please put more detail as your recipe is very brief and for the novice cook some things have to be assumed. For example you had mentioned half a cocunut for kothu, but we found this to be too much and we used 1/4 cocunut grating and 1/4 cocunut kothu. But the dish was excellent. 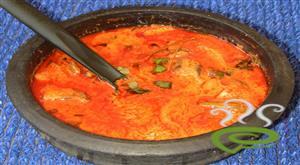 Do you have any "nadan" crab dishes?? Please put this up in pachakam.com. 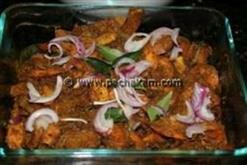 Generally your recipe is much superior to other recipes in pachakam.com. I cannot really explain how much I enjoyed this recipe. In fact, I had to even make a lot of it, when I made it the second time, due to high demand from my neighbors. One of my neighbors` wife who never eats beef, started eating beef after she tasted this recipe. Thanks a lot and will look forward to seeing more recipes like this one. It was very delicious and simple recipe. Where is the chollum powder in kattayam beef?Or is it without chollum!!!?? ?